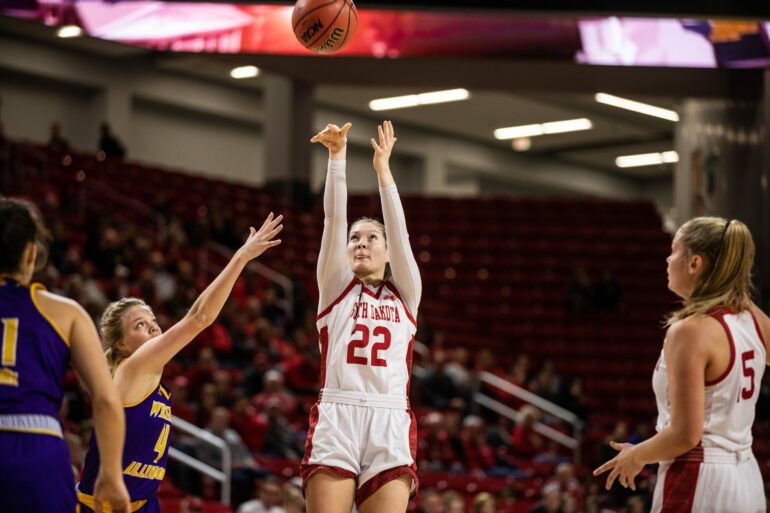 Five Coyotes scored in double figures as USD beat Western Illinois 92-49 in the Sanford Coyote Sports Center Saturday afternoon. Redshirt-sophomore Hannah Sjerven finished with a double-double of 22 points and 13 rebounds to lead the Coyotes. Junior Ciara Duffy scored 12 points and a season-high eight assists. Sophomore Chloe Lamb hit three big three-pointers early in the first quarter and finished with 15 points. Senior Allison Arens tallied 13 points and junior Taylor Frederick 11. The Coyotes defense held the Leathernecks under 30 percent shooting (17-61) and forced 16 turnovers. Western Illinois freshman Danni Nichols scored 16 points and junior Annabel Graettinger 10. The Coyotes built a 21-8 lead early in the first thanks to 11 points from Lamb. After a three-pointer from Leatherneck junior Kyra Washington, USD went on an eight-minute, 13 point run to extend the lead to 34-11. At halftime, their lead reached 30 points, and the Coyotes didn’t look back. The largest lead for USD was 48 points with just over two minutes left in the game. The victory sends the Coyotes to 19-3 overall and 7-1 in the Summit League. Western Illinois fell to 8-13 and 4-4. The game was the fourth in eight days for the Coyotes, three of which were on the road. They won all four games by an average margin of victory of 27 points. At the halfway point in conference play, the Coyotes defense tops the Summit League in field goal percentage (38.7 percent) and points per game allowed (59.5). Hannah Sjerven leads the conference in shooting percentage at 56.2 percent and second in blocks per game (1.7). The Coyotes are tied atop the Summit League standings with South Dakota State. USD will receive a few days rest before their next game on Saturday, February 2 at Purdue-Fort Wayne. The last meeting between the two was a 69-51 win for the Coyotes on January 12.